John Constable's painting Salisbury Cathedral from the Bishop's Grounds (dated 1823; Victoria and Albert Museum, London) is an apt cover illustration to Nicholas Orme's The History of England's Cathedrals. Within this vast painting looms a quintessential representation of an English cathedral, which in turn has become a quintessential icon of England. The structure is isolated within a timeless pastoral scene: cattle drip with water from a stream, ivy-lined trees echo the building's majestic spire, and the bishop directs the eyes of his wife and us (the viewer) towards the ascending Gothic mass. This is a visual parallel to a central contention within the text: Orme begins by reminding his readers that we feel familiar and comfortable with what an English cathedral is and what it represents, but just like Constable's imagery - seemingly genteel and chocolate-box familiar, yet once radical - the English cathedral has never been a static entity. Rather it is an institution in constant flux: sometimes subtly, other times in revolutionary fashion. As Orme deftly shows, we generally see "as much of them [cathedrals] as a ship sees of an iceberg" (3). In this expansive survey, Orme examines why these institutions were created and why they have continued to exist; he traces the communities and individual figures - ecclesiasts, kings, politicians, and citizens - who sustained and reformed them, and how the fortunes of cathedrals have waxed and waned. The narrative is cast in the long durée and it approaches English cathedrals as a collective group: while certain institutions are necessarily prominent, no single site unduly dominates the text; the reader is introduced to an ensemble cast. After the brief opening ('Why Cathedrals? '), the following eight chapters process chronologically along established and self-explanatory lines: the Romans and Anglo-Saxons; Norman and Angevin England; the Later Middle Ages (1250-1530); the Reformation; the sixteenth and seventeenth centuries ('Survival and Abolition, 1559-1660'); the Restoration and subsequent rise of Romanticism (1660-1800); the Nineteenth Century; and the Twentieth Century. The final chapter ('Forwards and Backwards') is more of an afterword in which the story is brought up to the present day. Each chapter works exceptionally well as a self-contained summary, and many readers will probably use the book in this way. Clearly signposted sub-sections review the most significant economic, cultural, political, religious, social, and theological issues of each period while also neatly discussing discrete topics such as: the murder and subsequent cult of Thomas Becket (51-55), the organisation of monastic cathedrals (69-72), the bonds between cathedrals and the nascent universities of medieval England (85-90), the patterns of Elizabethan worship (126-30), the rebuilding of St Paul's cathedral in London (154-60), the birth of antiquarianism (170-74), the re-emergence of nineteenth-century Catholic cathedrals in the country (191-94), the representation of cathedrals in Victorian literature (214-19), and the developments in the architecture of twentieth-century cathedrals (242-49). The narrative is also valuable and effective in its entirety. Certain patterns emerge regarding the economics of cathedrals, the tussles for control over them, their role in education, debates around corruption and reform, and the importance of music in their fabric and faith, among other themes. 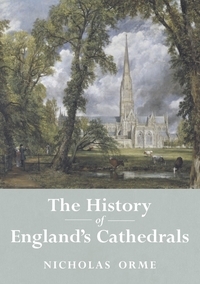 In short, one cannot but agree with the author that a cathedral "can be read as a miniature history of England" (2). This volume is very much aimed at a non-specialist audience and undergraduate readers. Beyond tracing the accretions, changes, and continuities of these institutions over 1400 years there is no striking unitary thesis or revisionist interpretation at work. The text is largely descriptive and summative. The prose is concise and deliciously lucid. It is a highly readable and unfailingly engaging work that will hold wide appeal. In a work of survey, such as this, it is important that the vignettes are judiciously chosen; here, they necessarily colour what could have been a human-less and humour-less narrative. We learn of the wonderfully named and wonderfully reprobate Bogo de Clare (d. 1294) who exemplifies the dangers of pluralism and absenteeism: on his death it was uttered that "God only knows if his life was worthy of praise, but no one thought it worthy of imitation" (43-44). Further cameos include: the personal recollections of pre-Reformation cathedrals by an elderly Durham man (123); the obstinacy of the troublesome Thomas Wood, dean and later bishop of Lichfield, in the late seventeenth century (163-4); Mrs Cotton's birdcage in the pews at Gloucester containing a robin which she believed to possess her daughter's soul (166-7); the nonchalant remarks of the Hereford Journal following the collapse of Hereford cathedral's west tower in 1786 (174-5); and Lord Burlington's derisory commentary on the pavement at York in which he assessed it "might have been invented by a schoolboy for his kite" (182). Each example adroitly illustrates wider points while also recalling the humanity of these cathedrals. Moreover, Orme's use of statistics successfully anchors substantive details within an ambitious narrative, whether it is the types of writings produced by deans and canons in the seventeenth century (143), the societal origins of canons at St Paul's (161), or the sources of income of Anglican cathedrals in 1992 (250). In particular, I found the numerous maps and plans, as well as the exemplary guide to technical terms (264-9), to be clear and useful references; they will prove valuable teaching tools. The volume is beautifully produced: the text is tight, neatly structured, and immaculately edited; in an age of ever-expensive books, the publishers are to be praised for delivering such quality at a reasonable price. The book is also richly illustrated, although there are a tad too many grainy nineteenth- and early twentieth-century paintings of cathedrals (e.g. Figures 2, 8, 16, 19, 27, 38, 67, 69, 74, and 78) that add little in comparison to the high-quality photographs found on other pages. Indeed, whilst this is resolutely not an architectural history of English cathedrals (4), it is a shame that the rich visual and material culture of these cathedrals is generally used as adornment as opposed to being discussed more fully as historical evidence in its own right. My additional quibbles are minor. The footnoting is light and confined to the bare essentials, but on occasion excessively so. For both better and worse, the prose is unencumbered with scholarly debate and historiographical discussion; this lends an authoritative tone but a few references to academic trends would add an additional layer. The curious reader will sometimes have to work hard to find further resources. On a broader intellectual level, the final chapter is caught between summary and analysis; the last paragraph is excellent and a worthy reminder as to the immense adaptability and creativity of these houses of Christian faith, but in general this section is frustratingly fleeting. It is a shame that a series of wider questions and issues were not raised here; in particular, one wonders what - asides geography - is English about these institutions, their organisation, history, and materiality? This is very much an insular history in which Europe plays a peripheral role. This focus is understandable, but a few choice comparisons with the Continental species would have proved stimulating. These meagre critiques underline the overall value of this work: it is a beautifully written account that marshals an overwhelmingly vast, fragmentary, and tangled corpus of material with skill. Despite its sweeping scale there is real substance to the text, which will both engage and please a range of readers. My final word of praise is that this book is eminently suited to its primary purpose: indeed, I have already used it in my own teaching where it has been favourably received. I heartily recommend others follow suit.